More heroes have been announced to return for Super Sentai Strongest Battle! As shown above, Yuki Kousei will continue his role as Keiichiro Asaka/Patren-1 directly after Lupinranger VS Patranger. 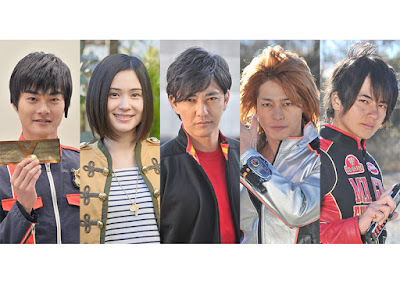 Also returning are Mao Ichimichi as Luka Milfy/Gokai Yellow, Noboru Kaneko as Kakeru Shishi/Gaored, Masayuki Deai as Eiji Takaoka/Boukensilver, and Yasuhisa Furuhara as Sousuke Esumi/Go-on red. Also returning as voice roles are Tetsu Inada as Doggie Kruger/Dekamaster, although the character Doggie himself also appears. Keiichi Wada returns to voice Tenkasei Ryou/Ryuuranger, and Hitomi Hirose will voice Tsuruhime/Ninjawhite. It's Satomi Hirose, not Hitomi. Sosuke is still look young , as Kakeru and Eiji has a wrinkles, well times goes by.